Featuring Seymour Duncan® JB™ Humbuckers! Epiphone presents the Ltd. Ed. Tommy Thayer "White Lightning" Explorer Outfit, the third signature model designed with legend Tommy “Spaceman” Thayer of KISS. 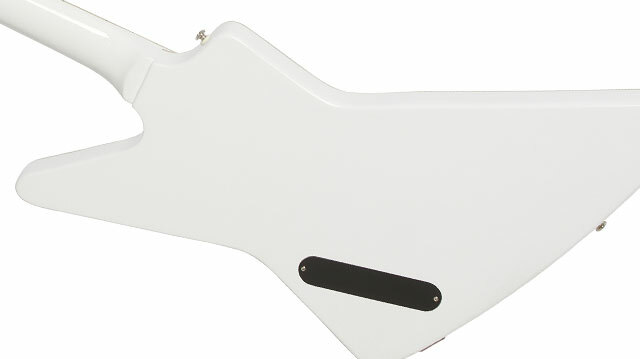 Featuring the classic Explorer body in a Custom Metallic White finish plus Seymour Duncan® JB™ Humbuckers chosen by Thayer, Grover® Rotomatic machine heads, a custom hard case and more. Plus, each Ltd. Ed. “White Lightning” Explorer also includes a hand signed Certificate of Authenticity in a presentation binder. "My new Epiphone White Lightning Explorer is hot, loud, and delivers the big sound I need onstage every night," said Thayer. "It's an instrument that suits musicians from all walks of life. My Epiphone signature guitars are a tried and true part of my arsenal. I never leave home without 'em!" Truss Rod Cover Chrome, Metal engraved / "Tommy Thayer"
Tommy “Spaceman” Thayer returns with his third custom Epiphone, the “White Lightning” Explorer Outfit, inspired by his “White Lightning” Les Paul. Tommy Thayer’s new Explorer features a classic Mahogany body with black and white binding on the top, and a chrome-metal pickguard. The Mahogany neck has a 1960's SlimTaper™-D profile that is glued to the body with a Mortise & Tenon joint. The neck has a traditional 24.75” scale length and a smooth Torrefied Composite fingerboard with pearloid "Dot" inlays. 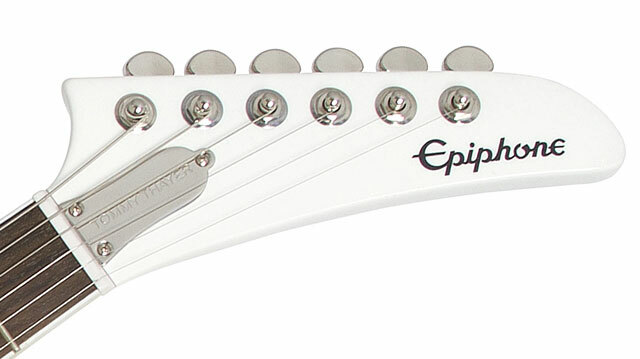 The adjustable truss rod has a chrome cover engraved with “Tommy Thayer” and a limited edition 'White Lightning" logo on the back of the headstock. Once again, Tommy Thayer as chosen legendary Seymour Duncan® JB™ humbuckers for his new Signature Explorer. Seymour Duncan began his career in the 1960s customizing pickups for legends like Jimi Hendrix and Jeff Beck. 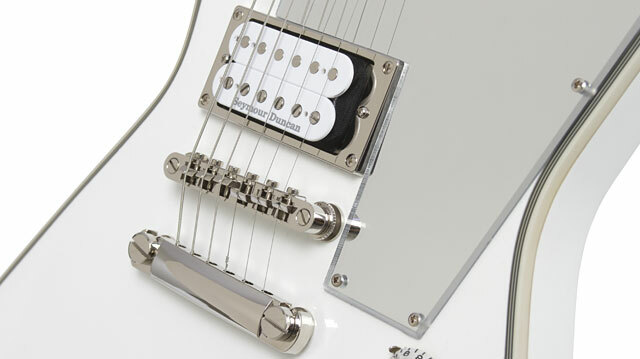 Thayer chose a Seymour Duncan® JB™ humbucker with chrome mounting rings for the neck position and another JB™ “open-coil” with white bobbins in the bridge position. Open coil-humbuckers are inspired by legends like Jimmie Page of Led Zeppelin and Duane Allman of the Allman Brothers who found their lead/bridge pickups had more “bite” if they removed the covers. White “TopHat” knobs control each pickup’s Volume and Tone and Epiphone’s all-metal 3-way pickup selector has a chrome cap and metal washer. Like all Epiphones, Tommy Thayer’s “White Lightning” Explorer comes with rock solid/road ready hardware including a heavy-duty 1/4” non-rotating output jack with chrome-metal jack plate and a classic LockTone™ Tune-o-matic bridge and Stopbar tailpiece for superb action and intonation. Mini-Grover® Rotomatics™ offer a super pro-level 18:1 tuning ratio. 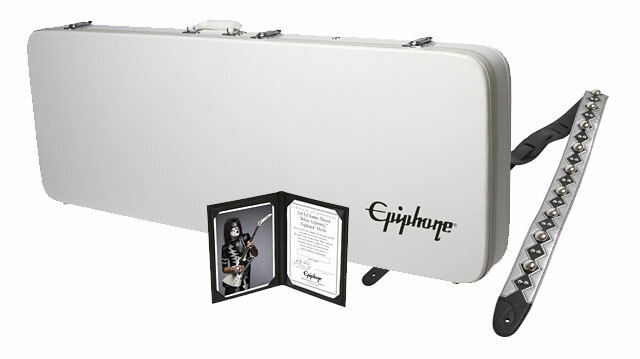 A custom white hard case is included along with a Studded Leather Strap designed by Tommy Thayer along with a hand signed Certificate of Authenticity. Like all Epiphones, the Ltd. Ed. Tommy Thayer "White Lightning" Explorer Outfit comes with a Limited Lifetime Guarantee along with Gibson’s legendary 365/24/7 Customer Service. All of Tommy Thayer’s previous Signature Epiphones have sold out quickly and you can bet the new “White Lightning” Explorer Outfit will, too! See your Authorized Epiphone Dealer today or visit Epiphone.com to find a dealer near you.